Pictured Below: The Flying Feather as conceved by Yutaka Katayama and designed by Ryuichi Tomiya in the late 40's. 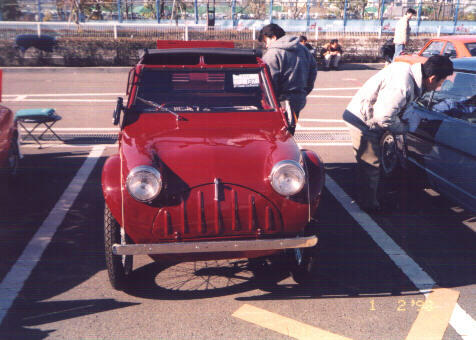 A prototype was built with a 200cc engine (built in-house by Nissan in 1951). 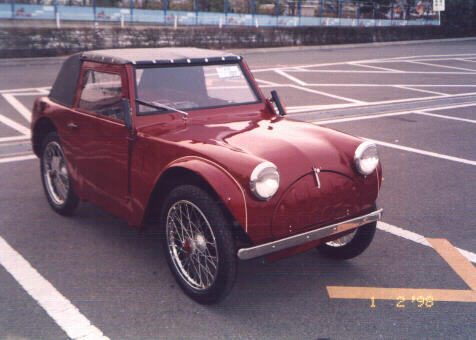 In Brief: Mr. Katayama (aka Mr. K), had a dream from childhood to build a very light weight car (mostly out of motorcycle parts). It was to have a combination of good performance and economy, rather like a gull in flight. Thus the name, "the Flying Feather". 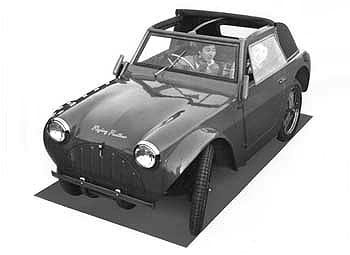 In the late 40's, Mr. K discussed this concept with Ryuichi Tomiya and a sketch was completed instantly. 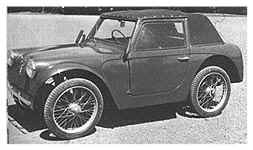 Ryuichi Tomiya had been in charge of body design at Nissan Motors Ltd. before WWII and he was considered to be a genius - later to be called "the Leonardo da Vinci of Japan". Suminoe Manufacturing produced about 150 Flying Feathers between 1954 and 1955. Today there are only a couple that we know of left in existence. One is on Display at the Tokyo Museum. 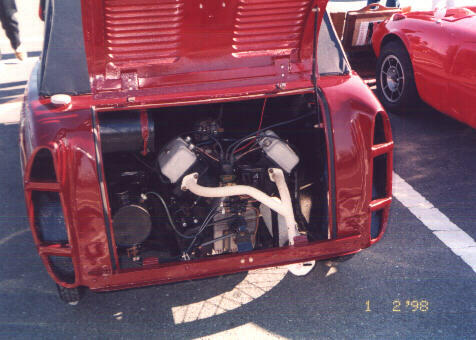 Above: Air Cooled, 12.5 HP, Twin Cylinder. All that POWER mounted in the rear! 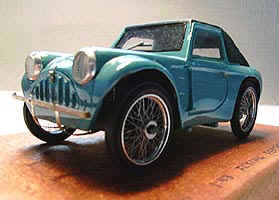 Below: A rare 1:43 Model by ROCO of Japan. Only 20 of these were handbuilt in resin. 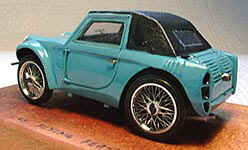 The wire motorcycle wheels are a real work of art. Above: An all too brief visit with Mr. K at the 2002 Z Car Convention in San Antonio, Texas. 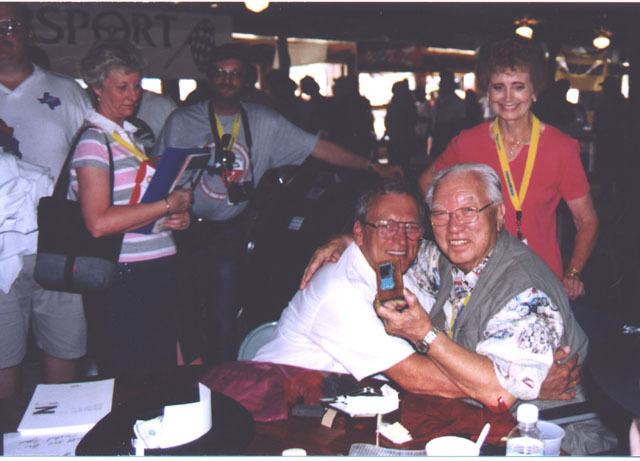 Here I get a big hug from Mr. K. He is holding a hand made scale model of the Flying Feather that I gave him. 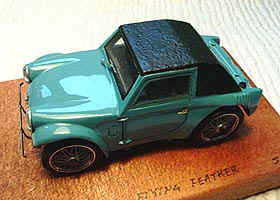 It's one of only 20 produced and like the Flying Feather itself a rare collectible.